After surviving a hurricane in the Caribbean, ivory poachers in East Africa, and a Cairo crime syndicate racing up the Nile, zoologist Jack MacGregor, his paleontologist wife, Mavis, and children, Chris, Ryan, and Heather, head to the wilderness of Alaska and encounter an unusual new threat from ecoterrorists. As in all MacGregor Family Adventure Series novels, the MacGregors are once again caught in a web of intriguing characters full of danger, deception, and plenty of techno-thrilling surprises. 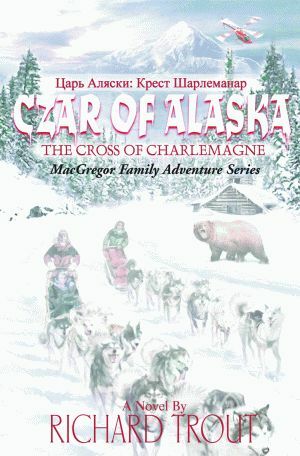 Three Russian Orthodox priests seek the religious artifact the Cross of Charlemagne, while their rivals, a rogue Vatican priest and a renowned Polish archaeologist, are following a trail across Alaska left by early Russian settlers, hoping to reach the treasure first. Meanwhile, an ominous international team of ecoterrorists armed with state-of-the-art weapons are determined to prevent oil drilling in the Arctic National Wildlife Refuge and get rid of Jack MacGregor once and for all. Featuring an entertaining cast of characters including the MacGregor teens’ new friend, Roy Nageak, an Inupiat native, Czar of Alaska is fast paced and action packed. Vivid descriptions of the exhilarating Alaskan mountains create the setting for a harrowing encounter with a grizzly bear, daring dogsled and helicopter excursions, and plenty of sibling rivalry and family challenges. With the aid of a local historian, the Russian Orthodox priests, a member of the native Alutiq tribe, and a seasoned FBI agent, the MacGregors strive to recover lost treasures and unwittingly find themselves trapped in a situation that has them fighting for their lives. As with all of Richard Trout’s books in the MacGregor Family Adventure Series, the book begins with a description of a historic event, putting readers in the throes of an a.d. 788 battle in the Bavarian Alps that sets the drama of the Cross of Charlemagne in motion. Richard Trout has degrees in biology and natural science and is a professor of biological sciences at a college in Oklahoma. He has been an accomplished scuba diver for over thirty years. His other books in the MacGregor Family Adventure Series include Cayman Gold: Lost Treasure of Devils Grotto, Elephant Tears: Mask of the Elephant, and Falcon of Abydos: Oracle of the Nile, all available from Pelican. The father of two grown daughters, he and his wife reside in Oklahoma City.